RELATIONSHIP ADVICE BLOG: Need Valentine's Day Help? TO DOWNLOAD the MP3 of this story, click on the MP3 link in the upper right corner of the page. Double-click any word to find the definition in the Merriam-Webster Learner's Dictionary. BOB DOUGHTY: This is SCIENCE IN THE NEWS in VOA Special English. I’m Bob Doughty. FAITH LAPIDUS: And I’m Faith Lapidus. This week, we tell about tsunamis -- the deadly sea waves often caused by earthquakes. 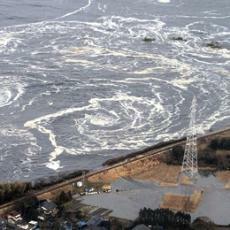 BOB DOUGHTY: People in Japan call them “harbor waves.” Tsunami is a two-character Japanese word. Tsu means harbor and nami means wave. Tsunamis happen after an earthquake strikes, either near or under the ocean. The earthquake displaces a large amount of water in the ocean. Waves then rush inland quickly and powerfully, causing death and destruction. Scientists say that strong earthquakes under the sea are responsible for eighty to ninety percent of all tsunamis. Volcanic explosions can also cause a tsunami. So could a large piece of land sliding into the water or when a rock from space strikes the ocean. There have been three major tsunamis worldwide in the past seven years. Generally, a major tsunami happens only once every ten years. FAITH LAPIDUS: In the deep ocean, a tsunami wave may rise up only about three hundred millimeters. In fact, people on a boat at sea may not even know that a tsunami wave has just moved past them. Tsunamis are long waves that can travel great distances very quickly - some move at over eight hundred kilometers an hour. They can cross an ocean in less than a day. Some people may not understand the difference between a tsunami and a tidal wave. Tides are the normal rise and fall of saltwater levels against the coast. Tsunamis are not normal tides - they are extreme events. And a tsunami is not just one wave, but a series of waves. Some of the waves can be huge. Scientists say the first wave is often not the largest. That is usually the third or fourth wave. The waves can be from five minutes to one hour apart. BOB DOUGHTY: How is a tsunami wave caused? The land underneath the ocean is made up of tectonic plates. These large areas are always moving. Usually the plates just rub up against each other on a crack, also called a fault line. Sometimes, one plate subducts -- or slides under -- another plate. Over time, a huge amount of pressure builds up on the plate that has slid under the other. It suddenly springs up, resulting in an earthquake. The large subduction zone earthquakes are responsible for most of the ocean-wide tsunamis, such as the recent tsunami in Japan. Scientists are able to measure the strength and position of earthquakes because there are hundreds of seismic monitoring stations around the world. If it is a strong quake and it happens near or in the ocean, computers quickly measure the length, depth and location of a quake. These measurements help to show how strong a resulting tsunami might be. FAITH LAPIDUS: When a tsunami forms, the wave can spread out quickly. As it gets close to land, the force of the water builds. People near the ocean may hear a loud, sucking sound, or a noise similar to a train or airplane. Then, a “drawback” may happen. Suddenly, a large area of coastline has very little water on it, because the water is moving away from land. But sometimes there is no drawback, and high waves come quickly toward the land with no warning. Some tsunami waves reach as high as thirty meters. BOB DOUGHTY: Three months ago, the tsunami that hit Japan destroyed houses, office buildings, cars, trucks, and even large boats. Thousands of people were killed. But many more would have died if not for a tsunami warning from the Japanese Meteorological Agency. That warning came just three minutes after the 9.0 magnitude earthquake struck near northeastern Japan. It was the fourth-most powerful earthquake ever measured worldwide and the worst to hit Japan. The tsunami waves that followed the earthquake came almost immediately. They were reported to have reached as high as nine meters in some areas. Japan has concrete sea walls wrapped around forty percent of its coastline. But those walls were not built for such high waves. In some areas, the sea walls were as low as three meters. FAITH LAPIDUS: Japan has one of the best tsunami early warning systems in the world. There are more than four thousand seismic intensity meters in place across the country to measure earthquakes. These meters provide information within two minutes of an earthquake striking. Information about the strength and the epicenter of the earthquake can be learned in less than three minutes. Earthquakes often strike Japan. Some of those earthquakes cause powerful tsunamis. 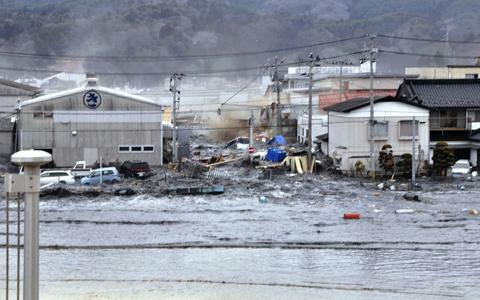 Japan has suffered hundreds of tsunamis over the years. But few were as powerful as the tsunami that struck the country’s northeast in March. BOB DOUGHTY: The National Oceanic and Atmospheric Administration is a government agency in the United States. NOAA officials use equipment on the floor and surface of the ocean to measure tsunamis. The great waves are difficult to predict. NOAA spends forty million dollars a year in an effort to protect the United States from tsunamis. The country has operated a tsunami warning system for forty years. It operates two tsunami warning centers – one on the Hawaiian island of Oahu and another in Palmer, Alaska. Jenifer Rhoades supervises NOAA’s Tsunami Program. FAITH LAPIDUS: NOAA says tsunamis can move much faster than anyone can run. The agency says people in coastal areas need to recognize signs of a possible tsunami. These include hearing a roaring or sucking noise, seeing the ocean suddenly pull back or rise, or feeling a strong earthquake that lasts more than twenty seconds. NOAA says the safest thing you can do is move to higher ground at once, or go to the top of a tall, strong building. You should not wait to hear a tsunami warning. And, once a tsunami wave has reached land, you should not return to the coastline until local officials say it is safe. That is because tsunamis are often made of many waves, and later waves can be higher than the first one. There can be as much as an hour between waves. You might have to stay away from low-lying areas for as long as twenty hours after the first warning. A powerful earthquake and tsunami struck the Indian Ocean on December twenty-sixth, two thousand four. More than two hundred thousand people on two continents were killed. After the tsunami, NOAA and the United States Geological Survey were given more money to help make tsunami warnings more quickly. NOAA is now able to reduce the time to provide tsunami warnings from an average of fifteen minutes to six. In some areas, NOAA can provide these warnings in less than three minutes. That reduction can help save many lives. FAITH LAPIDUS: But without a way to publicize that warning, such information is of little use. Local officials need to have a warning system in place. They also should have a plan for removing people from threatened areas. Officials are responsible for broadcasting warnings as fast as they can, by any method they can. The Helmholtz Association of German Research Centres says it has developed new technology for tsunami warnings. The group says today less time passes for an earthquake shock wave to reach a measuring instrument than in the past. But it is difficult to read and judge a wave when it is near. To deal with that problem, the designers developed a computer software program. They say the program can show the source, location and size of strong earthquakes within two minutes. BOB DOUGHTY: The Indian Ocean tsunami of two thousand four was among the worst ever reported. But the Pacific Ocean has experienced more of the deadly waves than other oceans. Experts estimate sixty percent of tsunamis take place there. NOAA says a tsunami cannot be prevented. But the harm that a tsunami causes can be lessened by people being prepared, by timely warnings and by an effective plan of action. FAITH LAPIDUS: This SCIENCE IN THE NEWS was written by Christopher Cruise, Jim Tedder and Jerilyn Watson. Our producer was June Simms. I’m Faith Lapidus. Do You Want To Learn English? Click on The Classroom Now! Use VOA's popular articles, now with language exercises! Expand vocabulary, reading and listening skills! Click on The Classroom to Learn English! Click Here For English Activities! Click Now & Improve Your English! We are teaching English on Facebook! Live English lessons with The English Traveler and the English Doctor on Facebook! Click in to learn English! Click Now to Improve Your English! Grammar that's easy and fun! Grammar that's easy and fun! New on Grammar Bytes -- Word Order of Adjectives! Take Me to Grammar Bytes Now!